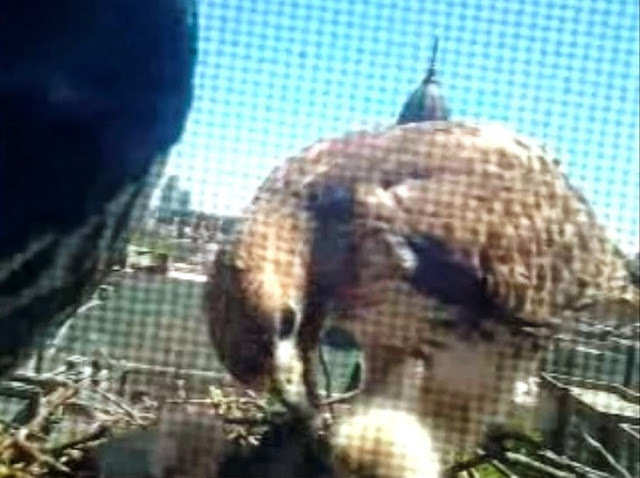 I couldn't resist posting more screenshots from the Cornell and Ageloff hawk nest cams today. 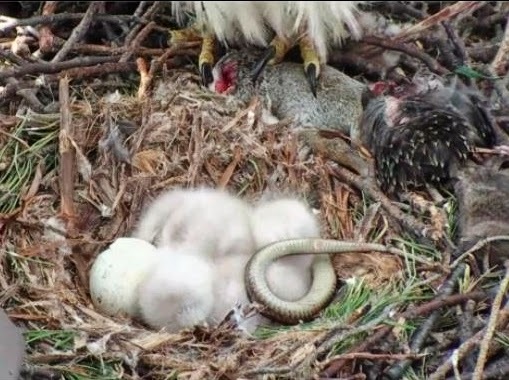 I tuned in to the Cornell hawk cam this morning to see the first two babies snuggled up with a snake. 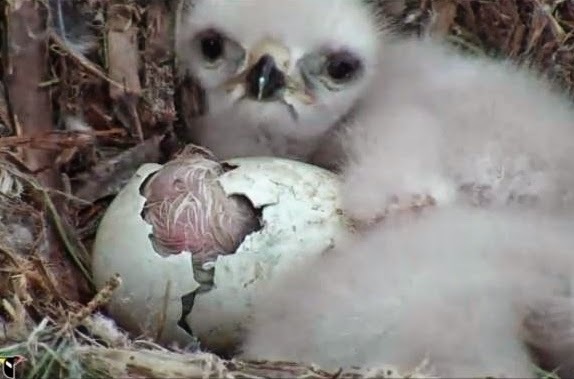 Around 1:45 in the afternoon, the last egg hatched, welcomed to the world by its older sibling. 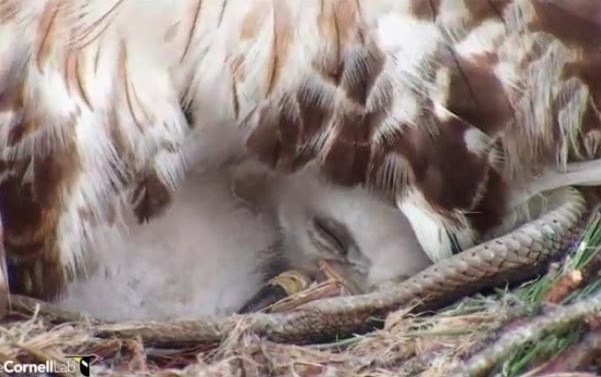 And about three hours later, the new nestling received its first meal from mom, Big Red. I was struck by how gentle the adult hawk was with her new baby. 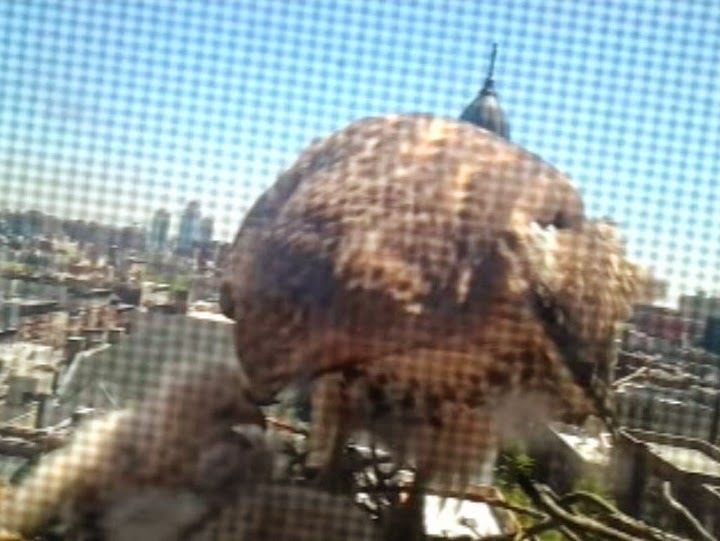 She tenderly cleaned off any egg debris and continued to groom it throughout the afternoon. As it slept, she gingerly moved sticks out of the way so the baby could rest its head better. 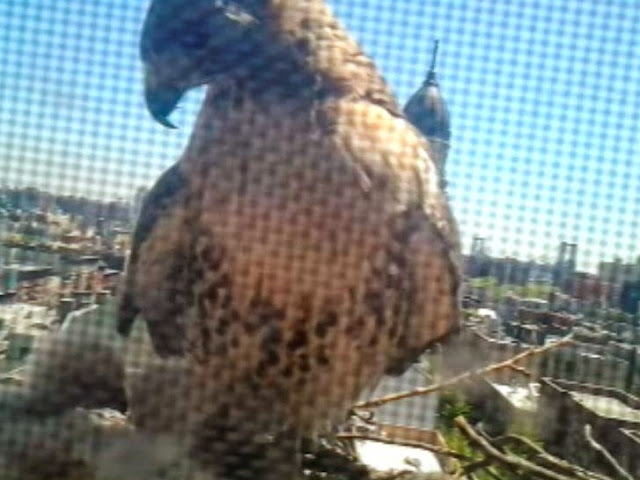 Meanwhile, on Avenue A, Christo and Dora's babies seem to be twice the size they were yesterday. The fuzzy bobbleheads are now visible from Cam 1, as well as close up on Cam 2. Here, Christo has a go at feeding while Dora stands by. Dora then took the opportunity to fly off for a break and left Dad to tend to the kids. He spent about 45 minutes patiently feeding them a pigeon. 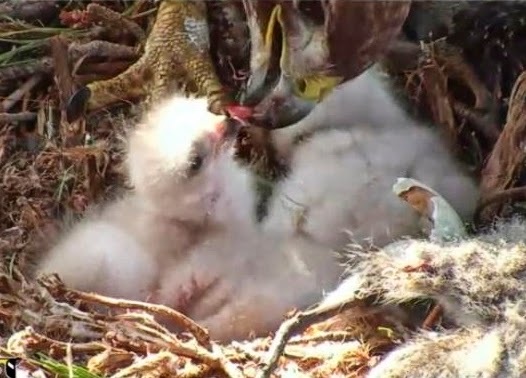 You can see all three nestlings here - the third is just barely tall enough to make it into the frame. In a month, they will be as big as Dad. I can't tell if it's the same individual or not, but one chick seems particularly active and dominant. It was already craning its neck to see over the edge of the nest. Seeing how fast the nestlings are growing - the oldest will be a week old tomorrow - I am a bit worried about the size of the nest. When Christo and Dora are both there, they barely have room to maneuver. 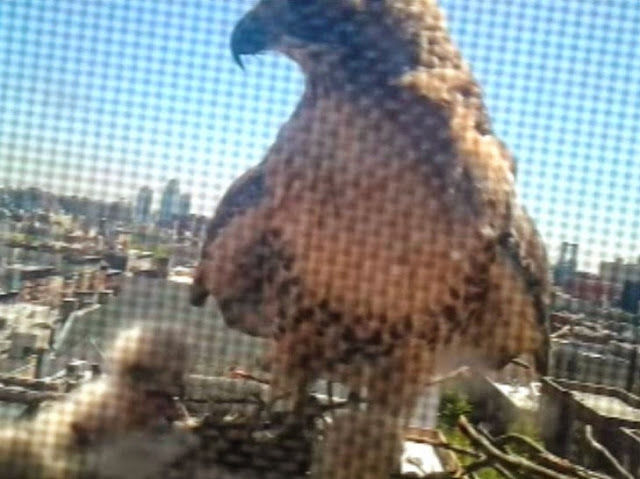 Last year, the young hawks at the Christodora nest learned to take turns flapping their wings and jumping up and down, so I hope they manage to work things out again on this smaller surface.